Wie muss unsere Wirtschaft aussehen damit wir den Klimaschutz schaffen? Diese und andere Fragen möchten wir im Gespräch mit Pedro Páez klären. Pedro Páez ist Wirtschaftswissenschaftler, ehem. Wirtschaftsminister Ecuadors, Mitglied der »Stiglitz«-Kommission der Vereinten Nationen und Verantwortlicher für Ecuador für die Entwicklung einer neuen Finanzmarktarchitektur in Lateinamerika. Er war federführend an der Konzeption der südamerikanischen Währung Sucre beteiligt, die als Verrechnungseinheit unter den Mitgliedsstaaten der ALBA-Gruppe („Bolivarische Allianz für die Völker unseres Amerika“ ) fungiert, die sich als Gegenkraft zu den US-Freihandelsplänen für Gesamtamerika, dem ALCA, zu formieren suchen. 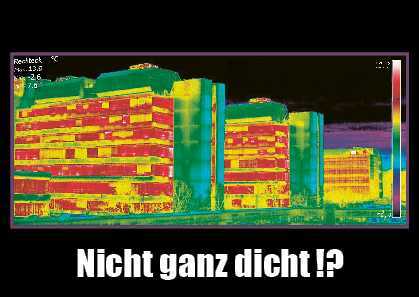 Eine Kampfansage an ein System ihrer fortlaufenden Unterdrückung! This is a useful and timely compilation of peer-reviewed articles in a field of immense public, political, professional and media interest. The need for effective biosafety regulations has been emphasized in many of the papers as well as in the report of the Parliamentary Committee headed by Shri Basudeb Acharya. Ms Kavitha Kuruganti has brought together in a readable form the latest scientific information on risks and benefits in relation to genetically modified crops. I hope the book will be widely read by all interested in ensuring that the new genetics represented by molecular biology becomes a blessing and not a curse. 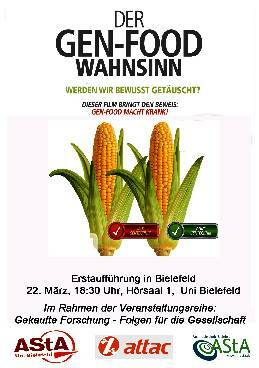 Das Buch " Transgenic Crops - hazards and uncertainties" ist eine kürzlich in Brasilien herausgegebende Zusammenstellung von 750 Studien, die von den Regulierungsbehörden nicht beachtet wurden. "This review of studies in the scientific literature that point to risks and uncertainties concerning the use of transgenic plants on a commercial scale does not claim to be exhaustive. Still, bringing together around 750 published articles that contradict certain aspects of the dominant view in the media and in the regulatory agencies, provides irrefutable evidence of lack of consensus in the scientific community on the subject. It should be noted the fact that this publication is not intended to support or reaffirm the findings and conclusions presented in these articles. The hypothesis of risks, even if reiterated, do not attest to the existence of real problems, and at the other end, repeated claims of absence of risk based on inconclusive studies do not provide effective security to the consumer. The purpose of this document is to prove one simple fact: extensive review of scientific studies published in specialized journals allows us to affirm that, within the limits of current scientific knowledge, we cannot conclude to the absence of risks in farming and feeding transgenic plants and parts. Or, in short, it is not possible to say, with seriousness and probity, that the technology involved does not imply significant risks to the health and the environment. Moreover, this book emphasizes the need of a similar work applied to the systematization of studies published in the scientific literature that conclude the absence of risks and uncertainties associated with the use of transgenic plants on a commercial scale. Such research would qualify and quantify the controversy that occurs in the scientific community on issues related to biosafety of such plants. At this point,it stands out that the literature used by regulatory agencies in the risks assessment of transgenic plants, are predominantly produced, financed or supported by interested companies or researchers who are or have been linked to biotech industry. In parallel, the analysis of these studies publication dates also shows that the controversy continues unabated and current, refuting fallacious claims that it is a resolved and surpassed debate." Contrary to the claims of its proponents, the massive venture to reconfigure the genetic core of the world's food supply has not been conducted in alignment with science but in significant conflict with sound scientific principles. For instance, its purported safety was initially based on assumptions about the nature and dynamics of DNA that have been decisively discredited, and yet its advocates continue to assert its safety as if those assumptions are still somehow legitimate. Further, although a substantial number of well-conducted studies published in peer-reviewed journals have detected statistically significant harm to the laboratory animals that consumed genetically engineered (GE) food, the proponents either ignore or unjustly attack this evidence. The unsoundness of the GE food venture, and the extent to which the aggregate evidence weighs against its safety, are attested by the well-documented fact that its proponents have needed to routinely and systematically misrepresent the evidence in order to sustain it. Moreover, besides being both theoretically and empirically unsound from the standpoint of biological science, the GE food venture is outright reckless when assessed from the perspective of computer science. While computer scientists have gained substantial knowledge about the inescapable risks of altering complex information systems, and established precautionary measures for managing those risks, the biotechnicians have routinely disregarded this knowledge and violated the related precautionary principles - despite the fact that the cellular information systems they reconfigure are far bigger, far more complex, and far less understood. Indeed, compared to the meticulous manner in which software engineers revise life-critical information systems that they themselves have created, the radical way in which biotechnicians have been altering complex cellular information systems does not even deserve to be called "engineering." Furthermore, even the newest so-called gene editing techniques (such as CRISPR-Cas9) are, when scrutinized through the lens of computer science, significantly imprecise and unacceptably risky. 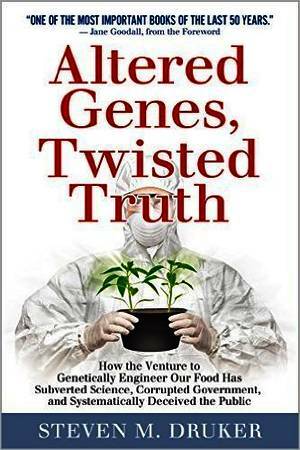 Although analyzing genetic engineering from the standpoint of software engineering is crucial for a proper understanding of the risks, a thorough examination did not appear until the publication of Altered Genes, Twisted Truth. The soundness - and the importance - of this examination have been recognized by many experts. For instance, Thomas J. McCabe, developer of the cyclomatic complexity software metric, a key analytic tool in computer programming employed throughout the world, has called it "especially insightful" and remarked that it exposes how genetic engineering "is more like a 'hackathon' than a careful, systematic methodology for revising complex information systems." Entgegen den Behauptungen der Befürworter wurde das Unterfangen, den genetischen Kern der Welt-Nahrungsmittelversorgung umzugestalten nicht im Einklang mit der Wissenschaft durchgeführt, sondern kollidiert mit seriösen wissenschaftlichen Prinzipien. So wurde die angebliche Sicherheit der GVO Nahrungsmittel auf Annahmen über das Wesen und die Dynamik der DNA begründet, die mittlerweile als unwissenschaftlich diskreditiert wurden. Trotzdem beteuern die Befürworter weiterhin ihre Sicherheit als ob diese Annahmen immer noch legitim wären. Und eine erhebliche Anzahl von ordentlich durchgeführten Studien, die durch Fachleute geprüft und in wissenschaftlichen Journalen veröffentlicht wurden, erfasste statistisch signifikante Schäden an Labortieren, die genetisch verändertes Futter gefressen haben. Allerdings werden diese Beweise von den Befürwortern entweder ignoriert oder zu Unrecht angegriffen. Die gut dokumentierte Tatsache, dass die Befürworter routinemäßig und systematisch die Beweislage falsch darstellen mussten, um ihr Vorhaben fortzuführen bezeugt den unseriösen Charakter des GVO Nahrungs-Unterfangen und das Ausmaß, in dem die gesammelten Beweise gegen ihre Sicherheit wiegen. Abgesehen davon, dass das GVO Nahrungs-Unterfangen aus der Perspektive der Biologie theoretisch und empirisch unseriös ist, ist es geradezu rücksichtslos aus der Perspektive der Informatik. Informatiker haben fundiertes Wissen über unüberwindbare Risiken bei der Veränderung komplexer Informationssysteme gewonnen und Vorsorgemaßnahmen zur Handhabung dieser Risiken entwickelt. Doch Biotechnologen haben dieses Wissen routinemäßig außer Acht gelassen und die damit verbundenen Vorsorgeprinzipien verletzt - ungeachtet der Tatsache, dass die zellulären Informationssysteme die sie rekonfigurieren weitaus größer, weitaus komplexer sind und viel weniger darüber bekannt ist. Verglichen mit der sorgfältigen Weise, mit der Programmierer lebenswichtige Informationssysteme überarbeiten, die sie selbst geschaffen haben, hat die radikale Art und Weise, wie Biotechnologen komplexe zelluläre Informationssysteme verändern, nicht einmal verdient "Technik" genannt zu werden. Sogar die neuesten so genannten "Gene-Editing-Techniques" (wie CRISPR-Cas9) sind aus der Perspektive der Informatik maßgeblich unpräzise und inakzeptabel riskant. Obschon eine Analyse der Gentechnik aus der Perspektive der Informatik für ein richtiges Verständnis der Risiken entscheidend ist, erschien eine gründliche Auseinandersetzung erst mit der Veröffentlichung von Altered Genes, Twisted Truth. Die Stichhaltigkeit - und Bedeutung - dieser Untersuchung wurde von vielen Experten anerkannt. So nannte Thomas J. McCabe (Entwickler der "zyklomatischen Komplexität" Software Metrik) das Buch "besonders aufschlussreich" und bemerkte dass es darlegt, wie Gentechnik "eher wie ein 'Hackathon' ist als eine vorsichtige, systematische Methodologie für die Überarbeitung komplexer Informationssysteme." Die landwirtschaftliche Anwendung dieser neuen Methoden kann weitreichende Konsequenzen für die Zukunft der Nahrungsmittelversorgung und für die Umwelt haben. Deswegen ist sie eine Angelegenheit, die einer breit gefächerten öffentlichen Debatte bedarf. Die Aufmerksamkeit der Medien hat sich bisher hauptsächlich auf die mögliche Anwendung auf den Menschen und damit verbundene Utopien und Horrorszenarien konzentriert. In der Tat wird an vielen medizinischen Anwendungen geforscht, wie z.b. der Heilung von HIV oder der Korrektur von Erbkrankheiten. Die kommerzielle Nutzbarmachung der Methode in der Landwirtschaft ist weit fortgeschritten und die Frage nach ihrer Regulierung ist akut. In den USA sind bereits Nahrungsmittel im Umlauf, die mit den neuen Methoden verändert wurden. (Sie wurden zugelassen, ohne dass sie die für gentechnisch veränderte Organismen notwendige Risikoprüfung durchlaufen haben.) Auch in der EU wurde bereits der herbizidresistente Raps der Firma CIBUS zugelassen, ebenfalls ohne die für gentechnisch veränderte Organismen notwendige Risikoprüfung. Die Produktentwickler argumentieren gegen eine Klassifizierung der neuen Produkte als Gentechnik, u.a. weil der Zulassungsprozess sehr kostspielig ist und Ähnlichkeiten zur herkömmlichen Züchtung gegeben seien. Derzeit entscheidet die EU Kommission darüber, ob 7 sogenannte 'Neue Züchtungsmethoden' dem EU Regulierungsregime für gentechnisch veränderte Organismen unterstehen oder ohne besondere Risikoprüfung auf den Markt gebracht werden dürfen. Es stellt sich die Frage, ob ein präziser Ort innerhalb des genetischen Materials und die Beschränkung auf eine einzelne und genaue genetische Veränderung verlässlich realisierbar sind. Kann eine punktgenaue Modifikation von vornherein eine technisch verlässliche Kontrolle über alle möglichen Effekte gewährleisten, sowohl für beabsichtigte als auch für unbeabsichtigte Effekte? Sind die mit CRISPR-Cas vorgenommenen Veränderungen an Pflanzen vergleichbar mit Veränderungen der Software von Herzschrittmachern, deren Quellcode wohl durchdacht und getestet wurde oder sind sie eher vergleichbar mit Veränderungen an einem Quellcode, den noch nicht einmal die Person versteht die ihn neu schreibt? Unter welchen Umständen können derartige Pflanzen als sicher angesehen und freigesetzt werden? 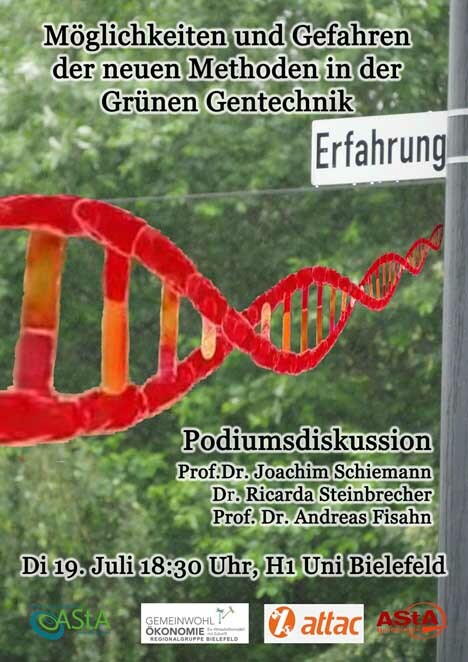 Prof. Dr. Joachim Schiemann leitet das Institut für die Sicherheit biotechnologischer Verfahren bei Pflanzen des Julius Kühn-Instituts (JKI), Bundesforschungsinstitut für Kulturpflanzen und ist Honorarprofessor an der Leuphana Universität Lüneburg. Er hat zahlreiche nationale und EU-finanzierte Verbundprojekte zur biologischen Sicherheitsforschung koordiniert, zuletzt das Projekt GRACE (GMO Risk Assessment and Communication of Evidence). 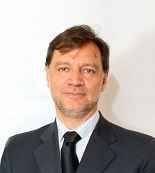 Prof. Schiemann war von 2004-2008 Präsident der Internationalen Gesellschaft für biologische Sicherheitsforschung (ISBR) und von 2003-2009 Mitglied im Wissenschaftlichen Ausschuss für gentechnisch veränderte Organismen der Europäischen Behörde für Lebensmittelsicherheit (EFSA). Neben zahlreichen Mitgliedschaften in nationalen und internationalen Wissenschaftsorganisationen ist Prof. Schiemann seit 2004 beratendes Mitglied im Lenkungsausschuss der Europäischen Technologieplattform "Plants for the Future". Dr. Ricarda Steinbrecher ist Molekulargenetikerin und Biologin und lebt zur Zeit in Oxford, Grossbritannien. Sie ist Sprecherin für die Vereinigung Deutscher Wissenschaftler (VDW) zu Fragen biologischer Sicherheit und gentechnisch veränderter Organismen (GVOs) in internationalen Verhandlungen und Beratungen des 'Internationalen Protokolls über die biologische Sicherheit' und der 'Konvention über biologische Vielfalt' der Vereinten Nationen, an denen sie seit 1995 teilnimmt. Sie ist berufenes Mitglied der internationalen Technical Expert Group (AHTEG) on Synthetic Biology, und war zuvor Mitglied der einberufenen Experten Gruppe des Biosicherheits-Protokolls über Risikobewertung und Risikomanagement gentechnisch veränderter Organismen. Sie ist seit 2000 Co-Direktorin der Organisation EcoNexus, die Entwicklungen der Wissenschaft und neuer Techniken sowie deren Auswirkungen auf Umwelt, Ernährungssicherheit und Gesellschaft analysiert. Dr. Steinbrecher hat kürzlich das Briefing "Gentechnik bei Pflanzen und die 'Neuen Züchtungstechniken'(NZT) - Inhärente Risiken und Regulierungsbedarf" veröffentlicht. Seit mehr als fünf Jahren werden Banken und Länder gerettet. Politiker schaffen immer neue Rettungsfonds, während mitten in Europa Menschen wieder für Hungerlöhne arbeiten. Sozialleistungen werden abgebaut, öffentliche Güter verkauft. Es wird gerettet, nur keine Rettung ist in Sicht. Für große Banken ist die Finanzkrise vor allem ein Geschäftsmodell. Und die ständig 'verstimmten' und 'enttäuschten' Finanzmärkte scheinen ein besonderes Wesen zu sein, das bei Laune gehalten werden muss. Der Film wirft einen Blick von unten auf die Probleme, die uns alle angehen. Experten und Betroffene in Griechenland, Spanien, Irland, USA, Deutschland und Island sprechen über Krisen, Gründe und mögliche Alternativen. 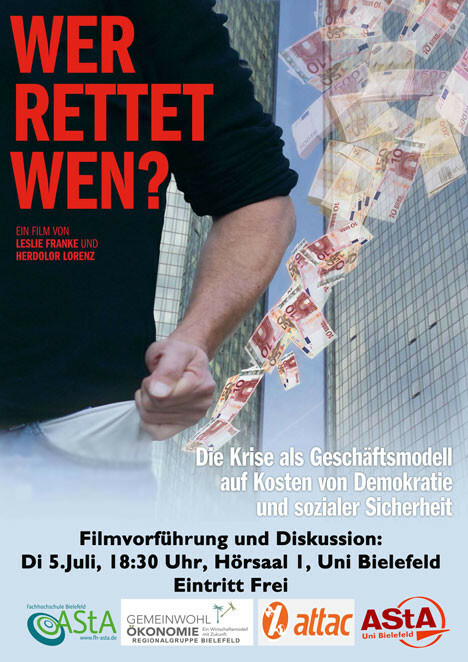 Nach dem Film gibt es die Gelegenheit mit Mitgliedern der Gemeinwohlökonomie Regionalgruppe Bielefeld u.a. über andere Wirtschaftsmodelle und ihre konkrete Umsetzung zu diskutieren. 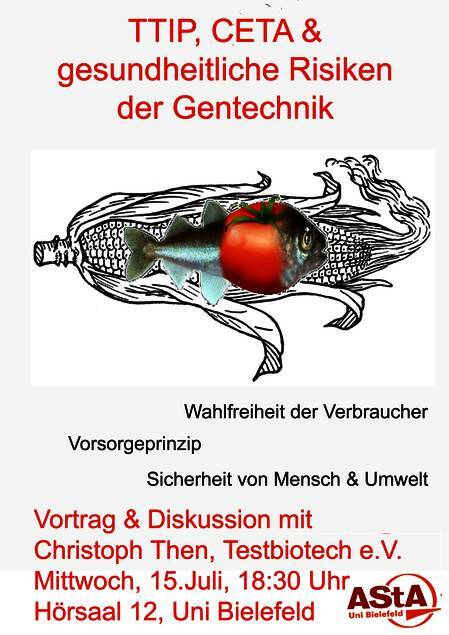 Im Rahmen der Veranstaltungsreihe Gekaufte Forschung - Folgen für die Gesellschaft zeigen der AStA der Universität Bielefeld in Zusammenarbeit mit dem AStA der Fachhochschule und Attac den Dokumentationsfilm Der Genfood Wahnsinn. 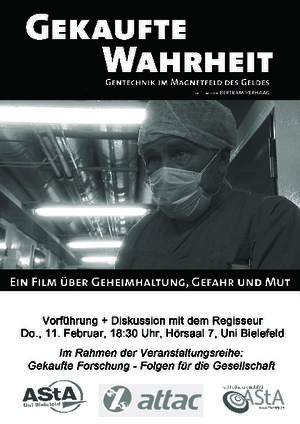 Der Film zeigt die aktuellen Erkenntnisse zu gesundheitlichen Risiken gentechnisch veränderter Nahrungsmittel an dem Beispiel der Gentechnik Branche in den USA. Anders als in Europa sind in den USA und Kanada gentechnisch veränderte Lebensmittel weit verbreitet. Dort sind für viele Menschen genveränderter Mais, Soja, Raps und Zucker normale Bestandteile ihrer Ernährung, mit weitreichenden Folgen für die Gesundheit. In Europa sind diese Produkte nicht für den menschlichen Konsum, aber als Futtermittel zugelassen. Daher sind die Erkenntnisse des Films nur bedingt auf Europa übertragbar. Doch einige der behandelten Probleme betreffen uns genauso, wie etwa der Mangel an Sicherheitsprüfungen und Industrie-unabhängiger Forschung zu den gesundheitlichen Risiken. So hat die EU Kommission Ende 2015 Hinweise der Weltgesundheitsorganisation auf eine krebserregende Wirkung des Pflanzengifts Glyphosat ignoriert und die Grenzwerte sogar angehoben. Glyphosat ist der weltweit am meisten eingesetzte Pestizidwirkstoff, und hat eine Schlüsselrolle in der Erzeugung von gentechnisch veränderten Nahrungsmitteln. Über die aus den USA importierten Futtermittel und die daraus gewonnenen Eier, Milch- und Fleischprodukte gerät der Wirkstoff auch in Europa in den menschlichen Organismus. Im Anschluss an die Vorführung wird es eine Diskussion geben, bei der Frau Rosi Reindl hinzugeschaltet wird, die mit ihrem Hintergrundwissen Fragen zu den im Film behandelten Beispielen beantworten kann. Die angebliche Sicherheit von Gentechnisch Veränderter Nahrung beruht schlussendlich auf dem Glauben, daß Gene nicht in hoch-komplexer Weise untereinander sowie mit den höheren Ebenen ihrer ökologischen Umwelt vernetzt sind und daß sie nicht sauber und fein aufeinander abgestimmt und daß sie nicht ordentlich auf der DNA arrangiert werden. Welche Folgen für die Gesellschaft und ihre Lebensgrundlagen aus dem Beharren auf diesen falschen Vorstellungen entstehen, wenn sie dem Aufbau eines "sicheren" Geschäftes mit einer Hoch-Risiko-Technik dienen (sollen), zeigt der Film "Gekaufte Wahrheit". Eindringlich verdeutlicht diese Dokumentation den immensen Aufwand, der auch gerade am Entstehungs-Ort akademischen Wissens, den universitären Einrichtungen, nötig ist, um grundlegende biologische Wahrheiten zu unterdrücken und um die immensen Gefahren zu zudecken, die sich aus ihrer Missachtung für das Überleben der Menschheit ergeben. Mit Gentechnik im Essen droht der endgültige Verlust der Lebensmittel-Sicherheit.Die allerdings ist eine unverzichtbare Grundlage einer jeden Gesellschaft, die bestrebt ist, sich selbst nicht zu auslöschen. Wie weit dieser Verlust bereits eingetreten ist, wird im Anschluß an die Vorführung im Gespräch mit dem Regisseur sicherlich auch Thema sein. Es gibt erhebliche Unterschiede zwischen der Gentechnikregulierung in den USA und Kanada auf der einen Seite und der EU auf der anderen Seite. Beispielsweise durchlaufen in den USA, anders als in der EU, längst nicht alle gentechnisch veränderten Pflanzen eine Risikoprüfung, bevor sie auf den Markt kommen. Das Vorsorgeprinzip, Maßnahmen zum Schutz der gentechnikfreien Landwirtschaft, die Kennzeichnung von gentechnisch veränderten Lebensmitteln spielen in den USA keine Rolle, sind aber in der EU zentrale Elemente der Gentechnikgesetzgebung. Bisher gilt: Auch wenn die Risiken im Detail noch nicht bekannt sind, können in der EU vorsorglich Maßnahmen ergriffen werden, um Mensch und Umwelt zu schützen. Auch eine Kennzeichnung kann unabhängig von bereits nachgewiesenen Risiken vorgeschrieben werden, um VerbraucherInnen ausreichende Wahlfreiheit zu ermöglichen. Das Vorsorgeprinzip, umfassende Kennzeichnung, Einschränkungen bei den Zulassungen und beim Anbau gentechnisch veränderter Pflanzen wird man unter den Rahmenbedingungen der geplanten Freihandelsabkommen aber kaum verteidigen können. Gleichzeitig kommen aber immer neue, risikobehaftete Produkte auf den Markt: Beispielsweise Pflanzen mit neuen Gen-Kombinationen, die gleichzeitig ein halbes Dutzend Insektengifte produzieren und gegen mehrere Herbizide resistent gemacht wurden. Oder Insekten, die mit synthetischer DNA ausgestattet wurden. Angesichts neuer Risikopotentiale müsste unter anderem das Vorsorgeprinzip deutlich ausgebaut werden - mit CETA und TTIP scheint das aber unmöglich. Dr. Christoph Then ist Geschäftsführer von Testbiotech e.V. (www.testbiotech.org). Er ist zudem ein Koordinator des internationalen Bündnisses "Keine Patente auf Saatgut" (www.no-patents-on-seeds.org). Christoph Then beschäftigt sich seit etwa 20 Jahren mit aktuellen Fragen der Gen-und Biotechnologie. Er ist Mitbegründer der Initiative "Kein Patent auf Leben!" und war bis Ende 2007 Leiter des Bereiches Gentechnik und Landwirtschaft bei Greenpeace Deutschland. Testbiotech befasst sich mit der Folgenabschätzung im Bereich der Biotechnologie, fordert & fördert unabhängige Forschung, untersucht ethische, wirtschaftliche Folgen und prüft Risiken für Mensch und Umwelt. Gentechnisch veränderte "Nahrung" gefährdet die Nahrungsmittelsicherheit während Befürworter betonen, dass diese davon abhängt. Die Diskussion um die Möglichkeiten der zukünftigen Nahrungsmittelversorgung findet auf einer pseudowissenschaftlichen Ebene statt, für die eine Fassade von scheinbar wissenschaftlich fundierter Forschung von den Chemiekonzernen aufgebaut wird. Dabei werden nicht nur Forschungsergebnisse verheimlicht, sondern auch Tatsachen verdreht. Das dient als Grundlage für die Zulassung der Produkte für den menschlichen Konsum. Die "Effizienz" der gentechnisch veränderten Produkte besteht entweder aus einer Resistenz gegen Pestizide oder daraus, dass die Organismen selbst Gifte produzieren. Das Resultat ist eine zunehmende Vergiftung unserer Umwelt und der Produkte, die wir zu uns nehmen. Die Unbedenklichkeit dieser Produkte ist keineswegs etabliert. Wo ist die Grenze zwischen Wissenschaft und PR? Die diskreditierung von Industrie-unabhängigen Wissenschaftlern und die damit einhergehende Einflußnahme auf den wissenschaftlichen Prozess ist ein Phänomen, das genau untersucht werden muss. (siehe http://www.enveurope.com/content/27/1/19) Ein Dialog über die Grenze zwischen Wissenschaft als fortschreitende Generierung von Wissen zum Gemeinwohl und PR-Arbeit für die Gewinninteressen von Konzernen ist notwendig, um eine Erosion der wissenschaftlichen Standards zu vermeiden. In dieser Vortrags- und Filmreihe wird die wissenschaftliche Kontroverse der grünen Gentechnik als Option in den Mittelpunkt gestellt.